If any of our readers has the “joy” of experiencing a commute to or from an urban area with frequent interchanges or has experienced the “wonder” of lane closures during rush hour, often without a worker in sight, this blog’s for you – but it’s probably not what you think. In the field of traffic engineering the zipper merge (late merge) is a concept designed to merge traffic into a reduced number of lanes as efficiently as possible. However, the human actions required are somewhat counterintuitive and emotionally taxing in actual practice. Logic says the most courteous drivers merge as soon as possible, and certainly well before that lane closure sign says, “lane ends 500 feet ahead.” However, traffic engineering studies have repeatedly illustrated this is not the case and that maximizing both lanes of traffic until they end is a much more efficient use of the road. Essentially, instead of creating a single long lane of cars with rippling brake lights, the zipper merge maximizes the use of available lanes and then “zippers” down through alternating cars to a single lane only when necessary. How can this be? The “early merging” driver, who genuinely believes they are doing the right thing and/or being a good person, often merges as soon as they see an opening in the lane next to them. Then they “rage” (I know I’ve done it) at the drivers who wait until the last minute to merge into the open lane a few cars ahead of them. While it’s counterintuitive, it turns out the zipper merge is the most efficient way to keep the traffic moving as quickly as possible. The parallel in client portfolio management is the act of rebalancing a portfolio to its long-term strategic asset allocation targets. While market cycles and the passage of time have repeatedly supported it’s the right thing to do, the concept of taking money from an outperformer and reallocating it to an underperformer is one of the hardest things for any committee to consistently practice in a portfolio. Uncertainty and exuberance are powerful motivators and so sometimes rebalancing just doesn’t feel right. Unfortunately, when portfolio rebalancing is the most uncomfortable for a committee to undertake, it’s often also the most critical time to implement. Ignoring the need to rebalance a portfolio is akin to not having a strategy at all. The visual behind the science is clear to anyone familiar with the ubiquitous “quilt-chart” of annual investment returns. 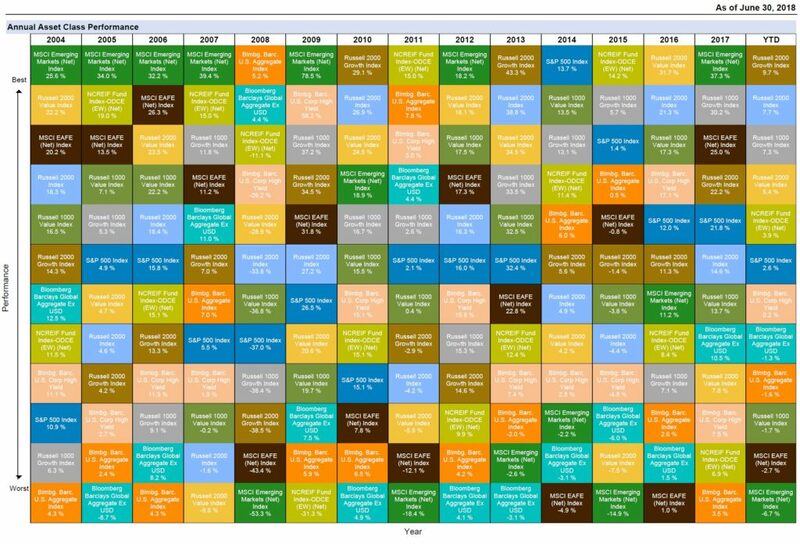 As seen above, a quilt chart is simply a color-coded display that ranks the performance of several asset classes from best to worst on a year-over-year basis. It’s a cold, hard truth that asset classes that appear at the top of the chart in one period do not hold the that title for all time. In fact, a spot at the top of the chart has generally been a fairly consistent indicator the asset class is due for a trip to the bottom of the chart. Given the uncertainty of markets, a prudent course of action for committees is to make rebalancing both a stated part of their investment policy as well as a regular part of their investment discussions at meetings. This is not to say rebalancing should be done at every meeting. Reasonable ranges around target allocations can help allow “outperformers to run” and rebalancing too frequently can be costly and inefficient. This cognizance can also make difficult rebalancing decisions easier to stomach since they are a regular part of normal committee discussions. The practice of consistent range and/or or time-based rules around rebalancing are a simple mechanism designed to help keep portfolios reasonably close to their desired risk and return levels without the need to tap the brakes too frequently. So, the next time you’re thinking of cutting over early before the lane ends because it feels like the right thing to do, think twice about the science behind the traffic pattern. In tandem, when you forget and end up cutting over to the open lane a little early, be a gem and let the car that waited until the last-minute zipper in, you’ll actually be doing your part to help everyone get to where they want to be a little faster.